Liverpool marked an emotional day for retiring legend Jamie Carragher with a comfortable 1-0 win over relegated QPR. 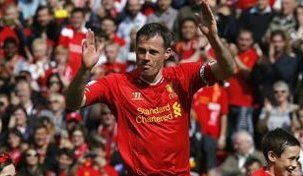 Though the winning goal belonged to Philippe Coutinho, the day of course belonged to the retiring Carragher, who received a hero’s welcome, a hero’s farewell and even managed to provide the moment of the match by smashing a 30-yard second-half drive against the woodwork. Harry Redknapp’s Londoners were dominated in both shots at goal and possession but despite a subservient performance which summed up their miserable campaign, the back four did a remarkable job to keep the scoreline so slender. Though Liverpool were locked in to finish seventh before match day 38 and QPR have long been marked for relegation, the retirement of ‘pool legend Carragher meant this dead rubber match was far from meaningless to some.